This time we'll be speaking with Samantha Meltzer-Brody, Hayworth Distinguished Professorship of Mood and Anxiety Disorders in the department of psychiatry, UNC School of Medicine. Precision medicine as applied to psychiatry offers the promise of seeking better lives for those suffering from mental illness. The World Health Organization has declared that maternal mental health problems constitute a major public health challenge. One of the most concerning conditions is perinatal depression (PND), defined as the onset of depression that occurs during pregnancy (antenatal) or within the postpartum period and is conservatively thought to affect between 12% to 20% of pregnant and postpartum women. As a result, PND will affect as many as 800,000 women annually in the USA. PND is a significant cause of morbidity and maternal suicide is one of the greatest causes of maternal mortality. Innovative approaches are needed to increase our understanding of the underlying pathophysiology of PND and develop novel treatments-- leading to the aspiration goal of delivering of ‘precision psychiatry’. This presentation will discuss current research in PND and the clinical implications. It will describe how technology has allowed us to use smart phones to conduct the largest genetic study to date of postpartum depression. We will also discuss new clinical trial data of a novel pharmacologic treatment for postpartum depression. Bio: Dr. Samantha Meltzer-Brody, MD, MPH is a reproductive psychiatrist and clinician-scientist who holds the Ray M. Hayworth Distinguished Professorship of Mood and Anxiety Disorders in the Department of Psychiatry, UNC School of Medicine (SOM). She founded and directs the UNC Perinatal Psychiatry Program of the UNC Center for Women’s Mood Disorders and also serves as Associate Chair of Faculty Development in the Department of Psychiatry. In addition, Dr. Meltzer-Brody is the Executive Medical Director for the system-wide Well-Being Program of UNC HealthCare and SOM. Her funded research investigates epidemiologic, genetic, and biomarker models of perinatal depression and includes novel technologies and treatment modalities focused on optimizing and personalizing treatment for women with perinatal depression. BEFORE THE TALK BEGINS: Sigma Xi will be hosting a 15-minute "speed networking" meet and greet session for our pizza lunch attendees, with the help of STEM in the Park. Many of our attendees have asked for more opportunities to get to know their fellow members, rather than just sitting down with their pizza. We hope this short engagement will help increase our community connection. 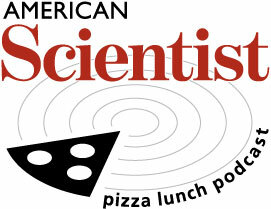 Thanks to a grant from the N.C. Biotechnology Center and funding from the RTP chapter of Sigma Xi and STEM in the Park, American Scientist's noontime Pizza Lunch speaker series is free and open to science journalists and science communicators of all stripes, as well as any interested member of the public. Feel free to extend this invitation to anyone who might want to attend. Talks are co-organized with Science Communicators of North Carolina (SCONC). The RTP chapter of Sigma Xi is a co-organizer and co-sponsor, and encourages any interested scientists to get involved with the chapter and its upcoming events. We thank RTP HQ for providing space. If you wish to be removed from this list, please email lutkoski -at- sigmaxi -dot- org. This list is opt-in only, so you're receiving this message because you asked to be on this list. If you are a Sigma Xi member and need to update your location or contact information with Sigma Xi, please email membership-at-sigmaxi-dot-org.